What Luke Skywalker accomplishes in the climactic final Act of Star Wars: A New Hope is nothing short of miraculous. Tasked with the responsibility of destroying the Empire’s planet killing Death Star, to succeed and win the day Skywalker unexpectedly gives himself over to the mystical energy field known as the Force. Doing so at the behest of the recently “deceased” Jedi Master Obi-Wan Kenobi, young Luke puts his faith in something greater than his available technology (or luck, or logic and reason), allowing the sacred and mysterious energy to guide his actions. In doing so, Skywalker not only saves the galaxy by destroying the Death Star, but also takes a giant leap of faith into a realm of wondrous possibility. As Skywalker speeds back to the Rebel base after the battle station explodes, Kenobi speaks to the young pilot from “the beyond”, reminding Luke that “the Force will be with you, always.” Luke Skywalker, farmer-turned Rebel pilot-turned galactic hero, will always have the Force as his ally. Yet, when we once again meet Luke in The Empire Strikes Back three years after his leap of faith and heroic deed, the young man has all but forgotten the Force is with him. After putting his faith in the Force in A New Hope, one would anticipate that when we meet Skywalker again that he will have started to more fully develop his understanding of, and connection to, the Force. This, however, is not the case, and is actually hinted at early in The Empire Strikes Back as Luke hangs upside down in the Wampa’s lair (having been ambushed and knocked unconscious by Hoth’s apex predator). His lightsaber protruding from the snow a few feet away, Luke’s initial instinct is to desperately grab for his weapon, and only concentrates on using the Force to bring the weapon to him once he recognizes the blade is out of reach. Luke hangs upside down in the Wampa’s lair. Luke’s use of the Force in this instance reminds the audience of his connection to the energy field while likewise foreshadowing the lessons he will learn when he makes his way to Dagobah in the film’s second act. After all, in the Wampa’s lair we see for the very first time that one can move objects using the Force. Later in the film, this reality will be expanded, with Luke moving boulders and the ancient Jedi Master Yoda using the Force to move Luke’s X-Wing Starfighter. 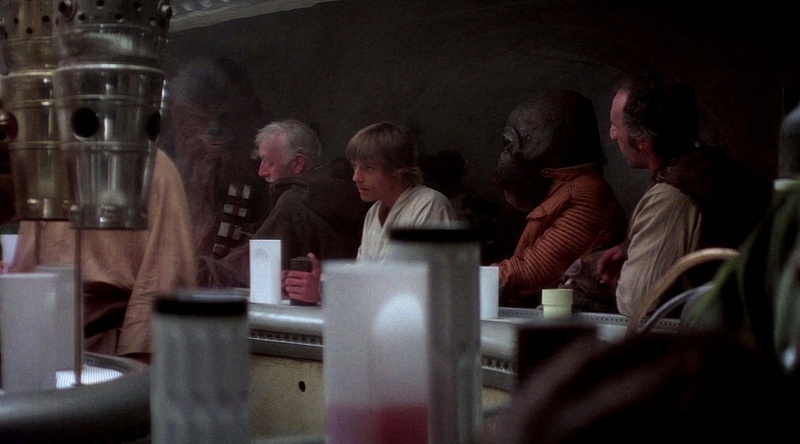 The episode in the Wampa’s lair likewise foreshadows the doubt and disconnect Luke will display, with respect to the Force, when he travels to the Dagobah system to learn from Yoda. The Force is certainly with him, but at the outset of The Empire Strikes Back it is a curious afterthought, a seemingly forgotten aspect of his being. Even after bringing the lightsaber to him in the lair, the Force seems to fade away as panic sets in, Luke maiming the Wampa and anxiously fleeing the snowy cave. At the end of A New Hope, Luke was the victorious hero who we last saw receiving a medal for destroying the dreaded Death Star. Now, only a short way into The Empire Strikes Back, Luke Skywalker stumbles out of the Wampa’s lair, his flight response fully in control. Unsurprisingly, Luke will succumb to the harsh elements on Hoth, collapsing into the snowy Tundra. Face down in the snow (see featured image above), his body surely experiencing the effects of hypothermia, it is here and now that Obi-Wan Kenobi curiously chooses to re-appear. Calling to the (freezing) young man, Kenobi appears in astral form and commands Luke to “go to the Dagobah system” where he will learn the ways of the Force from Yoda. 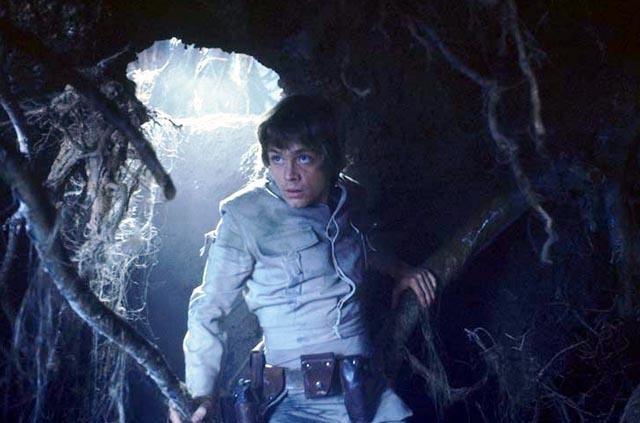 It is Luke’s journey to Dagobah that serves as the surest example of his mystical disconnect. Consider that as Luke flies his X-Wing into the planet’s atmosphere – the very same X-Wing he piloted to destroy the Death Star! – he relies entirely on the starfighter’s technology to guide him to the planet’s surface. “All the scopes are dead. I can’t see a thing…” he exclaims as he descends into the thick, dense atmosphere/fog covering the planet. The technology at his disposal fails him, and [a panicked] Luke does not call upon the Force to serve as his guide. It is no wonder he crashes into the swamp. Luke stands on the nose of his X-Wing after crashing in the swamp on Dagobah. In turn, what makes this scenario all the more fascinating is that Dagobah is teeming with life, and as Yoda will explain to Luke, it is life which makes the Force grow. “Luminous beings are we, not this crude matter,” the elderly Master will note once young Skywalker has started his rigorous Jedi training. Luke, we know from his actions in A New Hope, already has a special connection to the Force, an ability to destroy a planet killing superweapon thanks to faith alone. Never-the-less, piloting his X-Wing to Dagobah, Luke Skywalker is incapable of navigating his way to the surface of a planet glowing with the radiance of the Force. In the three years between the end of A New Hope and The Empire Strikes Back, Luke Skywalker has chosen to ignore, or has simply forgotten, his connection to the Force. Or, perhaps over time he began to doubt the mysterious energy field, placing more trust in technology than on the mystical source of his power. Indeed, Luke express such doubt to Yoda – “you ask the impossible”, the young man will exclaim when given a Force-specific task – and Yoda will note that it is Luke’s doubt, his inability to believe in the possibility of the impossible, which makes him fail. Luke is knocked off his Tauntaun when the Wampa attacks. He falls from the ceiling of the Wampa’s lair. He stumbles over a snow drift as he escapes the lair, and later falls to the ground as he walks across Hoth’s desolate tundra. His Snowspeeder crashes when it is struck by a laser blast. After destroying an AT-AT using his lightsaber and a thermal detonator, he unhooks his harness and falls far to the ground below. Piloting his X-Wing, he crashes into the swamp on Dagobah. Exiting his X-Wing, he jumps into the swampy marsh and must crawl up the muddy embankment. When he is doing his first handstand during his Jedi training, moving large rocks while Yoda sits on his feet, Luke becomes distracted and falls. Later, doing another handstand, suspending a number of containers and his droid R2-D2 in the air, he again becomes distracted once again. As he battles Darth Vader he is knocked into the carbon-freezing chamber; he is blasted out of a window; stumbles to the ground and barely escapes Vader’s next attack; and falls, by choice, into the great abyss at the center of Cloud City after learning he is Vader’s son (presumably choosing death rather than continuing to face his father). After falling into the abyss on Cloud City, Luke ends up literally hanging below the city on a weather vane, grasping desperately with his one hand (the other had been cut off, along with his lightsaber, by his father) for the door above him. Even here, in this desperate situation, the literal and metaphorical lowest point in his life, Luke forgets his connection to the Force, instead trying to climb to safety with his single hand. Unsurprisingly, Luke once again slips and begins to fall, this time only being saved by his legs (which catch the weather vane). Just as he was hanging upside down in the Wampa’s lair at the beginning of the film, at the end of the film Luke is once again in a desperate situation hanging upside down. In a sense, this is the most appropriate metaphor for the existential situation Luke Skywalker finds himself in throughout The Empire Strikes Back – his heroic journey has quite literally been turned upside down. Where he gave himself willingly to the Force in A New Hope, placing his faith in something greater, in The Empire Strikes Back he stumbles and falls as he attempts to rekindle, and grow, in his understanding of and relationship with the Force. Eager to learn about the sacred energy field in A New Hope, Luke’s forgetfulness and doubt are why he crashes and fails in The Empire Strikes Back. While I absolutely love Ahsoka Tano and find her an enthralling Star Wars character, I am also torn by the reality that Tano, a child, was a combatant in the Clone Wars. Story-wise this was purposeful, as a juvenile protagonist – a “youngling” as Obi-Wan Kenobi calls her – was needed to draw younger viewers to The Clone Wars film and television series of the same name, giving kids a character that they could easily identify with. Narrative necessity aside, no one can deny that when she arrives on the planet Christophsis in the movie, Ahsoka Tano not only takes her first steps towards becoming a Jedi Knight but also becomes a child soldier. Admittedly, when I first watched The Clone Wars movie and series I was never bothered by this reality. In all honesty, it never even crossed my mind until recently. So deeply enchanted by the new Star Wars stories being told, so excited to experience the Clone Wars which Obi-Wan first spoke of in A New Hope, it never dawned on me that Ahsoka Tano’s participation in the war was/is egregious. That Jedi Master Yoda would see fit to use the youngling as a courier, carrying an urgent message into the heart of a major battle is alarming, especially considering she is sent without any body armor. That he and the Jedi Order would allow Ahsoka and other Jedi children to be warriors in the conflict is appalling. Then again, while alarming and appalling, it is not entirely surprising. The Jedi Order – Master Yoda included – was quick to take command of the clone army in Attack of the Clones, an army of genetically bred soldiers who were also, technically speaking, just children. That the ancient Order, committed to using the mystical Force for “knowledge and defense, never for attack” would move so swiftly to militarize is disconcerting, proof that the Jedi were not only imperfect but also flirted with the Dark Side. Sending children into battle, younglings such as Ahsoka Tano and Caleb Dume (himself younger than even Tano) is but another reminder that the Jedi Order in the late days of the Old Republic acted, at times, in morally and ethically repugnant ways. I am interested to hear what you have to say about Ahsoka Tano as a child soldier, but I would also encourage you to check out the sites below to read more about the plight of child soldiers around the world. When Darth Maul’s return was first flirted in Season 3 of The Clone Wars animated series, I was pretty skeptical. At the time, I thought it was a ridiculous stunt to bring back to life a character who had been sliced in half, his bifurcated body having fallen into an abyss in The Phantom Menace. Yet, the way Maul’s return was handled grew on me, and over time I not only accepted that he was still alive – something I could not argue since he was literally on screen – but that the way he was brought back was handled with care. While I certainly have my grievances with some of the story-arcs in Star Wars, Darth Maul’s return eventually became, and still is, one of my favorites. As I said in a recent post where I discussed Maul’s return – The Power to Cheat Death – the fact that the young Dark Lord of the Sith survived his injuries opened the door to rethinking a number of aspects of the Star Wars universe. In keeping with this stream of thought, for this post I wanted to think about how Maul survived, the way he was able to sustain his life even though he had been horribly injured. Long before Darth Maul even arrived in person in The Clone Wars, questions began floating about how he could have survived his horrific injury. Thankfully, this was a question that was answered rather early on in Maul’s story-arc. In the Season Four episode “Revenge” – literally the episode that follows his re-discovery – Maul explains that while his body was broken, his hatred kept his spirit intact. Submerged in darkness, Maul became a self-described “rabid animal,” surviving on the junk world Lotho Minor until many years later his brother, Savage Opress, discovered him. While his description of survival is brief, what Maul explains in “Revenge” is an intrinsic and fascinating aspect of the Dark Side of the Force. Bathed in his hatred – hatred towards Kenobi, the Jedi, his old Master, etc. – Maul found himself consumed by the Dark Side in a way he had never prepared to encounter. In this regard, Maul’s survival was purely accidental. While he should have died due to his injuries, the Dark Side of the Force sustained his spirit – the Living Force within him – because Maul instinctively, although inadvertently, tapped into an intense and visceral level of hatred welling within his being. But the consequences of this deep level of hate and Dark Side submersion are clear: in cheating death, Maul lost all sense of his individuality, of “humanity,” becoming a wild animal. Darth Maul, physically and mentally broken, living as a rabid animal on Lotho Minor. Notice that he is quite literally a beast, his mechanical “body” resembling that of an arachnid. With this in mind, it is worth recalling one of the most iconic and profound quotes about the Dark Side in Star Wars, a quote found in Revenge of the Sith. Speaking to Anakin Skywalker, Chancellor Palpatine (aka Darth Sidious) describes the Dark Side of the Force “as a pathway to many abilities some consider to be unnatural.” Darth Maul’s survival is a perfect example of one of the most unnatural abilities swirling within the Dark Side, the ability to cheat death. There is nothing natural about Maul’s survival, about the ability for one to physically cheat death. After all, as Yoda also states in Revenge of the Sith, “death is a natural part of life.” That all life must die is normal, a consequence of the gift of life. To cheat death is unnatural, a subversion of the gift. Yet, as Maul proves through his hate-filled survival, the ability to subvert, to undermine, the gift of life is inherent within the Dark Side of Force. And since it is life which creates the Force – as Yoda also eloquently states, this time in The Empire Strikes Back – and it is also true that death is a natural part of life, how are we to make sense of this dark ability to cheat physical death? On this last point, another question arises: could one tap into and sustain the same level of hatred as Maul, preserving their corporeal existence through the Dark Side, while also maintaining their sanity and identity? To this I would answer yes, but to do so would require years of intense and methodical training. Just as one must first learn to swim before diving into the deep end of a pool, so too must a Sith, Knight of Ren, or other type of Dark acolyte learn to wade into the darkness if they are to cheat death, prolonging bodily existence and mental stability. While it is necessary to give into and cultivate the hatred that will take one deeper into the dark abyss and unlock the incredible powers inherent within, it is equally necessary that one exercise intense control over this hatred lest it completely strip them of rational thought. Furthermore, in answering this question, I would also go one step farther and suggest that Darth Sidious was already treading the dark path towards cheating death. In the novel Tarkin, Sidious hints at coaxing the “final secrets” from the dark side and considers that “success would grant them [he and Darth Vader] the power to harness the full powers of the dark side, and allow them to rule for ten thousand years.” While he does not explicitly state the intention to cheat death, the sentiment is nevertheless implied in his wish to rule for ten thousand years. As Sith believe there is nothingness after death – a philosophical point raised in The Clone Wars episode “Sacrifice” – the only way Sidious could rule indefinitely is if he was to preserve his Life Force in his body, utilizing the Dark Side to forgo death and extinction. And since Sidious was training to do just that, steadily submerging himself deeper into the darkness in order to unlock the unnatural powers it contained, I cannot help but wonder if he – like Darth Maul before him – was able to survive his “death” in Return of the Jedi. A thought worth pondering, but one I will leave for another day. “You don’t know the power of the Dark Side,” Vader promises Luke during the climactic scene of The Empire Strikes Back. As Luke struggles to survive his encounter with the Sith Lord, both physically and emotionally, we see the central struggle of the Star Wars Saga once again – the struggle between the Light and the Dark…and the Dark looks like it’s winning. We see this play out through all six films, in Anakin, in Luke, and across the galaxy as a whole. It’s a struggle we share, and one that often gets the best of us. That is one of the most important parts of Star Wars as a modern myth. It’s meant not just to entertain us but to teach us as well. We’re meant to connect to the myth, just as it masterfully connects to itself. With this in mind, a thought struck me as I read the first issue of Marvel’s (brilliant) Darth Vader comic. Whether this connection was intentional on the part of the author Kieron Gillen or not isn’t the point (although I’m pretty sure it was). The revelation hit regardless. 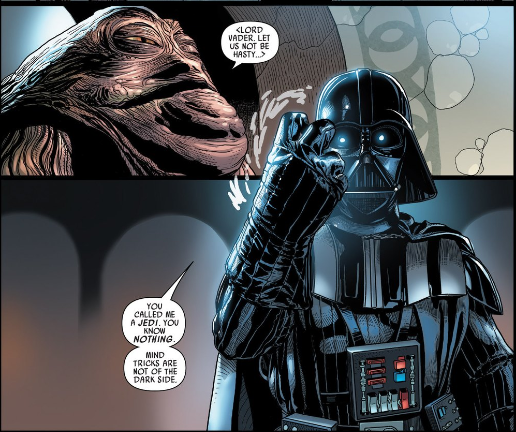 The comic opens with Vader entering Jabba’s Palace for a negotiation. The whole thing feels very familiar, calling to mind the opening of Return Of The Jedi and Luke’s entrance to Jabba’s Palace. The gate raises. Vader decapitates two Gamorrean guards. He then forces an audience with Jabba where the Hutt warns him not to attempt any mind tricks. Lord Vader chastises Jabba the Hutt. Yes, this is a condescending swipe at Luke. But, as with so many moments in Star Wars, this serves multiple purposes. Bib Fortuna is stating a very real truth. Luke is no Jedi. He has fallen quite far from the path and the opening pages of Darth Vader #1 illustrate that in a new (and brilliantly connected) way. Darth Vader shows Jabba, in no uncertain terms, the difference between the Jedi and the Sith. When Luke appears in the same spot years later, he acts as a Sith does. He is no Jedi. Yoda teaches Luke about the Force. Anger. Fear. Aggression. Easily they flow…yet they will consume you. The Dark Side offers power – quick, easy, and strong. But it will take and corrupt you as payment. It is impossible to use the Dark Side without sacrificing all that is good in you. It seems like it can be helpful, that it can even be used to good ends. But that is an illusion, the seductive allure of the Dark Side. We live in a culture where the Myth of Redemptive Violence reigns. We are taught, by the silent (and often sinister) voices of our culture that we can solve our problems, right wrongs, even defeat evil by using violent means. It is a challenge to even consider rejecting the Myth of Redemptive Violence, much less committing to and living out that rejection. It’s scary to reject the norms of culture. It’s also difficult to believe we can triumph over the forces of darkness in our world without violence and retribution. Luke poses the same questions to Yoda as they train. Yoda refuses to even entertain the idea of using the Force for anything other than knowledge and defense. Anything else is of the Dark Side. Luke, like all of us, wonders why we can’t use it – from time to time – if our motives are pure and our cause is just. Why can’t we, to quote singer-songwriter Bruce Cockburn, “kick the darkness ’til it bleeds daylight”? Because, Yoda would answer (traditionally with far more inverted syntax), that’s the Dark Side. Yet Luke can’t see this, as we learn when he reaches the cave. Yoda—“Only what you take with you. Your weapons…you will not need them. Luke descends into the cave on Dagobah, weapons anchored around his waist. Ignoring Yoda, Luke straps on his weapons belt and (quite symbolically) descends into the cave. He also takes in his anger, fear, hate, and self-doubt, illustrated (again, symbolically) by his weapons belt. These emotions take the form of Darth Vader because he is of the Dark Side and the Dark Side gets its strength from those very same emotions. This vision of Vader doesn’t draw his weapon or attack until Luke does so first. Therefore, Luke fails the test in the cave because he becomes the aggressor. He attacks. He gives in to the Dark Side. 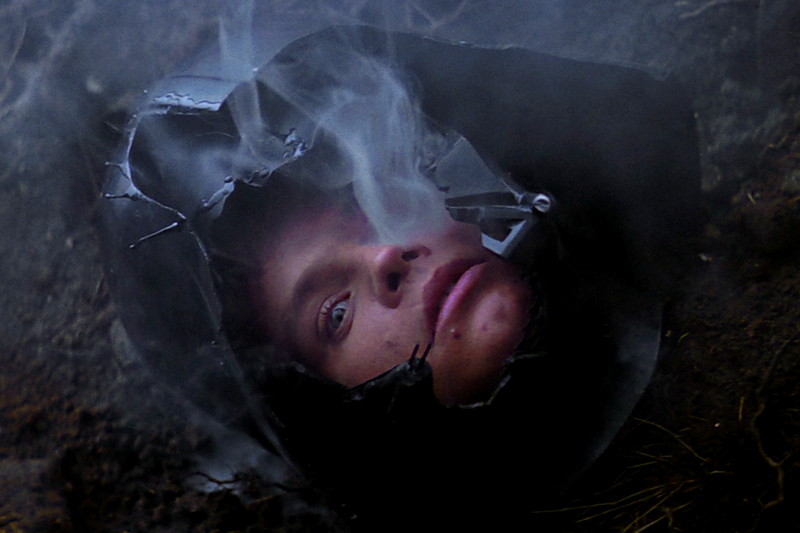 Once Luke kills Vader he sees his greatest fear—his face in Vader’s helmet. This symbolizes what Luke may become. (It also symbolizes something Luke doesn’t know yet, that Vader is his father and they are both susceptible to the pull of the Dark Side.) Despite his failure at the cave, Luke still draws his lightsaber first when he’s confronted by Vader on Cloud City. Vader toys with Luke in combat, goading him to let go of his hate as it’s the only way Luke can hope to defeat him. With Luke physically beaten, Vader reveals he is Luke’s father, breaking him spiritually and emotionally. He takes Luke’s hand as well as any sense of self Luke had. This all leaves Luke balancing on the precipice of the Dark Side – a place his father has stood before. So when Return Of The Jedi opens, it’s no surprise that Luke is acting as Darth Vader did in Jabba’s Palace. Vader is no Jedi. And, at that moment, Luke isn’t either. The struggle at the core of Star Wars continues to play out, in Luke as it did in Anakin a generation before…as it plays out in each of us every day. Fear. Anger. Aggression. They feel omnipresent, in our world as well as in Star Wars, and they can often seem impossible to overcome. But they aren’t, as Luke shows us. Luke transcends the seductive pull of the Dark Side. He shows us what we are meant to be. We are called to so much more. “Luminous beings are we.” But if we believe that it’s impossible to transcend these violent forces, well that is why we fail. Like a number of other long-time Star Wars fans, I have some heated thoughts about a Han Solo film being made that looks at the iconic smuggler’s back story before A New Hope. To save some time I will just say this: Harrison Ford is Han Solo. There, now you know where I stand on the film. My friend Alicia, who will have the honor of being the first guest writer on The Imperial Talker, will have a much more thorough analysis of the Han Solo film announcement soon. In the meantime, I wanted to take an opportunity to bounce around a couple of my own stand-alone film ideas. Now, I could very easily just start listing off films I would like to see, but that would be pretty underwhelming. Instead, I decided to come up with a synopsis for two stand-alone films based on characters who have been floating around the “will they get their own movie” rumor mill: Yoda and Obi-Wan Kenobi. In the remainder of this post, I will lay out my idea for what I personally want to see in a Yoda film and, in the next post, I will lay out my idea for a Kenobi film. After painting a picture of the Yoda film, I will give a little rationale on why I want to see this film in particular…but only a little. I don’t want to give away everything I have in mind because, well, I want to see if you like the idea without me trying to sway you one way or the other. You and your friends arrive at the movie theater on opening night, eagerly anticipating the newest Star Wars film aptly named Star Wars: Yoda. Taking your seats, you each banter about what you will discover about the mysterious green alien and Jedi Master. Will we finally discover his species? Where he came from? What Yoda was like as a young Jedi Padawan and Knight? How he became a Jedi Master and the head of the Jedi Council? Will the film present his adventures traveling the galaxy with his own Master, or will it delve into his own internal temptation and the lure of the dark side? …but the theme does not begin. Instead, the sound of a gentle breeze can be heard blowing. The screen begins to fade into an opaque and misty white, a fog. Now, with the gentle breeze remaining a constant sound in the background, other sounds begin to invade your ears: A creature in the distance lets out a cry, water splashes, a twig snaps. Ten minutes have elapsed and finally the fog begins to break, allowing you to make out the landscape more clearly. A dark swamp is all around, moss hanging from mangled and knotted trees, the muddy ground covered by a foggy haze. A black pond rests in the foreground, bubbles periodically breaking the purity of the water’s surface. In the distance, a reptilian creature flies between trees and disappears into the darkness. The scene and the sounds persist. 20 minutes elapse, then another 20, and another. It isn’t until an hour and ten minutes into the film that something different finally happens – a light rain begins to fall. The drops disrupt the tranquility of the pond. The rain continues, becoming a downpour that waxes and wanes as storm clouds move above this part of the swamp. Finally, the storm passing, the downpour lightens and eventually ceases. Out of the distant darkness, a low growl can be heard, and a branch cracks. Then, except for water dripping from branches and vines, there is silence. A serene sense of calm descends upon the dank forest and marsh. Suddenly, without warning, the scene tilts up and to the right, and you can see into the tree canopy above. Slowly, the scene pans left, and then downward following a nearby tree trunk to the muddy ground it calls home. Returning to the starting point, the same scene you have viewed for the last hour and a half, but you can now hear someone breathing along with the sounds of the swamp. Something unexpected happens. Moving forward, the camera turns around 180 degrees, bringing him into focus sitting on a decaying log near the water’s edge. He turns his head upwards, rotating from one side to the other. Yoda’s breathing remains, along with the sounds of the swamp, as the scene fades to black and the credits begin to roll. I know what you are thinking: A lot of people would be really upset if they paid to see this film. Yeah, you aren’t wrong. I bet people would be outright furious. But the thing is, I don’t want to see a film about Yoda that creates an experience any different than what I just presented. Frankly, I want an aura of mystery to constantly swirl around the elderly Jedi Master, and worry that any work dedicated to him will eliminate that mystery for the sake of profit. 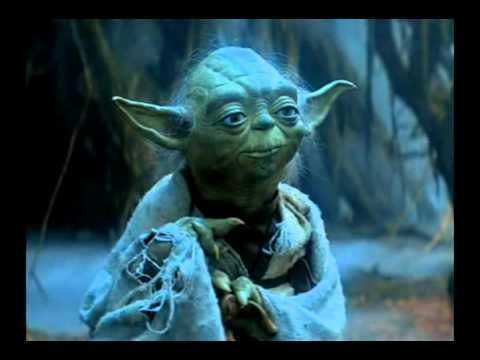 To me, the thing that is most important about Yoda is not what species he is, or what he was like as a young Jedi, or the adventures he has had in the past, but rather, his simplicity, his serenity, his connection to the living Force. 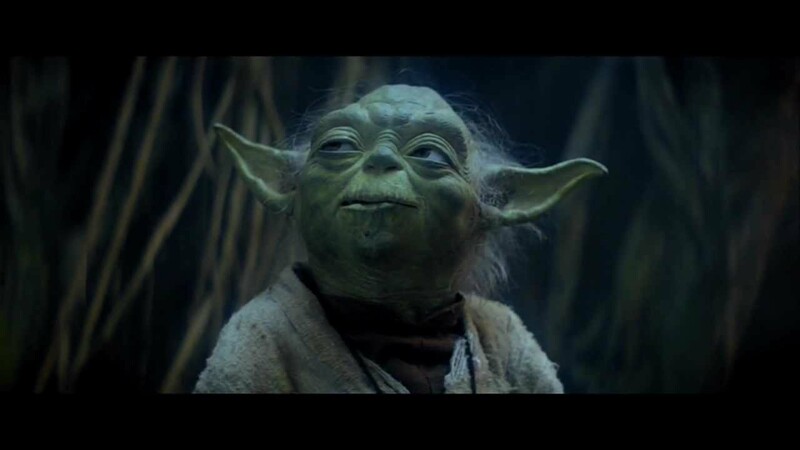 Give me a film where we sit with Yoda as he takes in and experiences the beauty around him in a swamp on Dagobah, a film that honors the Jedi Master’s love and respect for life. This is what I want, but what about you? 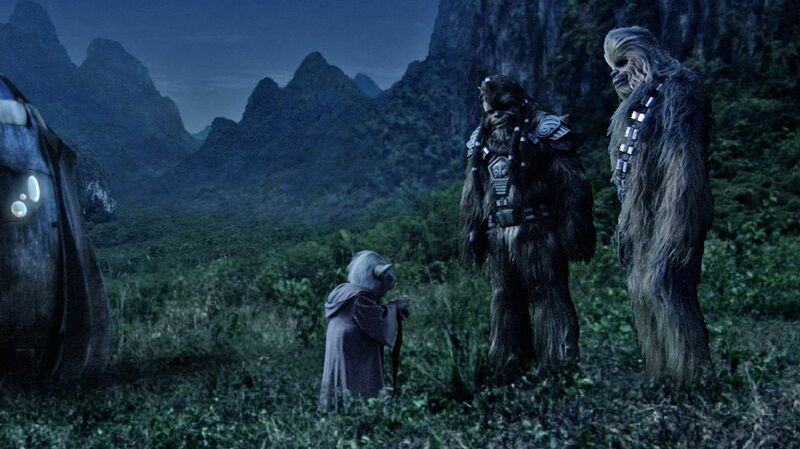 Would you want to see this film or do you have a different vision for a film dedicated to Yoda? Let me know in the comments below.